Chives are an herb, related to onions and garlic, with long green stems and a mild, not-too-pungent flavor. The green stems are the part of the chives that are used as an herb. Chive stems are hollow and are usually used fresh. 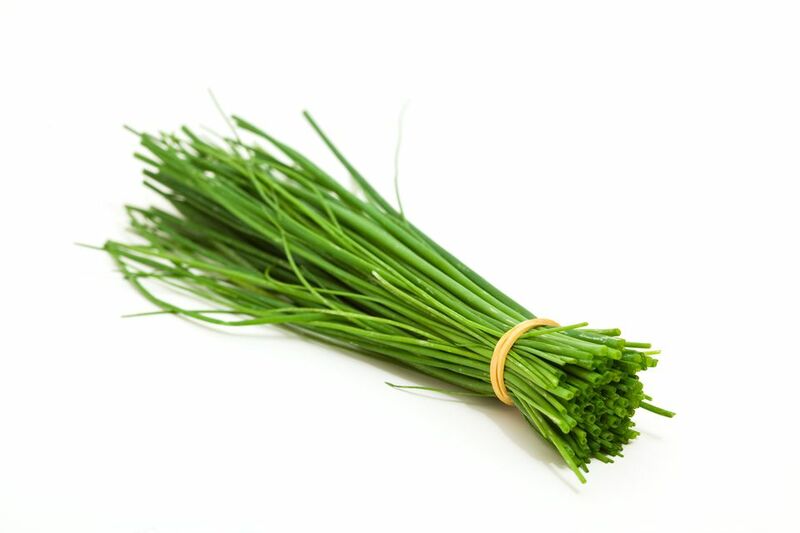 Chives are typically chopped and can be used as a garnish, although they do have a mild oniony flavor, especially fresh ones. Chives can be featured in all sorts of recipes, from baked potatoes to soups, salads, sauces and omelets. They're frequently mixed with cream cheese to make a savory spread. Chive butter, a compound butter made by blending chopped fresh chives into butter, is frequently served with grilled steaks or roasted poultry. One of the lovely things about chives, as compared with their cousins the scallions (also known as green onions or spring onions) is their delicate texture. Unlike scallions, with their wide tubes, chive stems are extremely narrow indeed, which makes them particularly attractive as a garnish, whether chopped and sprinkled over a dish, or draped whole across an entree. When you think of a baked potato, it's white (at least on the inside). You'll probably top it with butter and sour cream, also white, or at least pale yellow. Nor are any of the flavors of potato, butter or sour cream particularly pungent. Thus the appeal of chopped chives on a baked potato. It adds color and a contrasting flavor profile that pairs perfectly. Chives are related to but not the same as garlic chives. Garlic chives have wider, flatter stems which are not hollow, and they have a rather pronounced garlic flavor. Chive plants develop bright purple blossoms which are edible and also have a mildly garlicky, oniony flavor. As a matter of fact, chives are a wonderful herb to grow if you are feeling like you might like to start your own herb garden. Even if it's just a garden of a single herb. Chives grow well pretty much anywhere, provided they have enough sun and adequate water. And the beauty of them is that whenever you need some chive, all you have to do is go out and snip off however much you need. The stem will continue growing even after you've trimmed it. This means that a single good-sized chive plant will supply all the chives you are likely to need. What's more, chives are good on just about anything. Their mild, oniony flavor pairs well with any savory dish, and the bright green color adds visual appeal as well. When it comes to the blossoms, I like to remove them before they go to seed. Additionally, the stems on which the blossoms grow are tougher than the ordinary chive stems. So rather than just snipping off the blossoms and leaving the stems, I snip off the whole stem, then trim off the blossoms and discard the stems. The blossoms are great as a garnish, or you can saute them or even roast them with chicken. Try making chive butter, but with the chopped up purple blossoms instead. Or warm them up in some olive oil, then let the olive oil return to room temperature and use it for making chive blossom aioli.